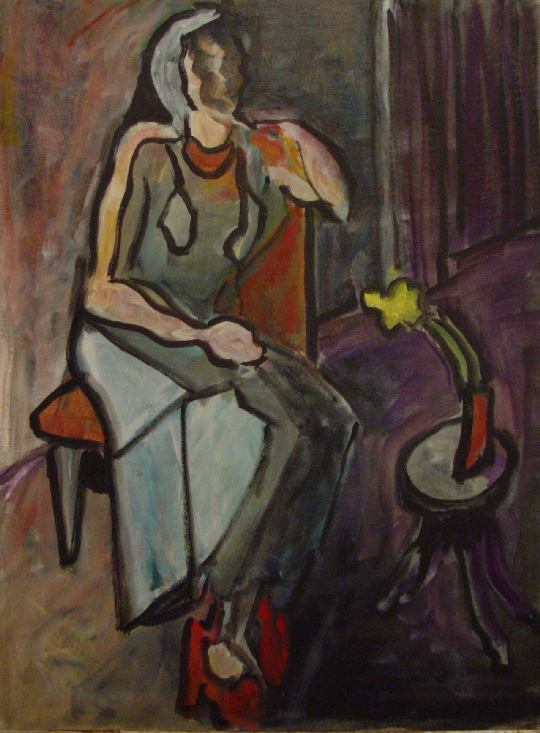 My painting portrays a woman contemplating a flower. This is an abstract painting done loosely, with the interplay of the reds as one element, the highlighted areas of the woman’s body and flower counterbalancing each other, and the purple providing the backdrop. The theme is the fading of youth, both in the flower and the figure of a lady. The painting is part of a series in which I combine realism with elements of abstract patterns. As an artist, I find it stimulating to continue to study art, and have taken several classes at Hyde Park Art Center (HPAC) in recent years. I’ve especially enjoyed classes with Darrell Roberts, the noted abstract expressionist. I was pleased when Darrell invited me to display several of my paintings in the RP33 meeting room at the center. My paintings are available for purchase at HPAC through February and March. Founded in 1939, the Hyde Park Art Center is at once a contemporary art exhibition space, learning lab, community resource, and social hub for artists and art-curious alike. Located at: 5020 South Cornell Avenue, Chicago, Illinois.